The economic imperative for collaboration will only increase over time, as part of the transition from a linear economy of value chains, to a circular economy of value cycles in which the minimisation of economic and ecological externalities is the overarching goal of economic optimisation. The linear ‘take, make, dispose’ model relies on large quantities of easily accessible resources and energy, and as such is increasingly unfit for the reality in which it operates. Working towards efficiency—a reduction of resources and fossil energy consumed per unit of manufacturing output—will not alter the finite nature of their stocks but can only delay the inevitable. 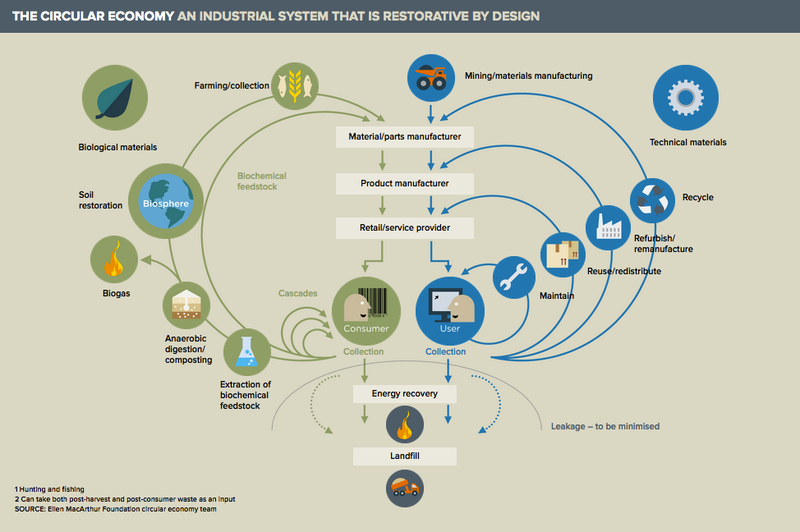 The circular economy refers to an industrial economy that is restorative by intention; aims to rely on renewable energy; minimises, tracks, and hopefully eliminates the use of toxic chemicals; and eradicates waste through careful design. The term goes beyond the mechanics of production and consumption of goods and services, in the areas that it seeks to redefine (examples include rebuilding capital including social and natural, and the shift from consumer to user). The concept of the circular economy is grounded in the study of non-linear, particularly living systems. Design out waste – Waste does not exist when the biological and technical components (or ‘materials’) of a product are designed by intention to fit within a biological or technical materials cycle, designed for disassembly and re-purposing. The biological materials are non-toxic and can be simply composted. Technical materials and other man-made materials are designed to be used again with minimal energy and highest quality retention. Build resilience through diversity – Modularity, versatility, and adaptivity are prized features that need to be prioritised in an uncertain and fast-evolving world. Diverse systems with many connections and scales are more resilient in the face of external shocks than systems built simply for efficiency—throughput maximisation driven to the extreme results in fragility. Work towards using energy from renewable sources – Systems should ultimately aim to run on renewable sources—enabled by the reduced threshold energy levels required by a restorative, circular economy. More integrated food and farming systems reduce the need for fossil-fuel based inputs and capture more of the energy value of by-products and manures. The transition towards such systems increases demand for human labour and provides opportunities for innovation. To fast-track adoption of more circular business models measures such as a shift of taxation from labour to energy and material consumption can be introduced; which would also make sure that efficiency pressure is associated with the true bottleneck of a resource-consuming society/economy. Think in systems – The ability to understand how parts influence one another within a whole, and the relationship of the whole to the parts, is crucial. Elements are considered in relation to their environmental and social contexts. The majority of real-world systems are non-linear, feedback-rich, and interdependent. In such systems, imprecise starting conditions combined with feedback lead to often surprising consequences, and to outcomes that are frequently not proportional to the input. Such systems cannot be managed in the conventional, linear sense, requiring instead more flexibility and more frequent adaptation to changing circumstances. Understanding flows in complex systems is important for the trade-off between efficiency and resilience. Systems that are increasingly efficient have fewer nodes, fewer connections, and greater throughput, but also become increasingly brittle. This makes them vulnerable to the effects of shocks such as price volatility or interruption of supply. Systems with many nodes and connections are more resilient, but can become sclerotic—slow to change, and thus ineffective. Think in cascades – For biological materials, the essence of value creation lies in the opportunity to extract additional value from products and materials by cascading them through other applications. In biological decomposition, material is broken down in stages by microorganisms that extract energy and nutrients from organic waste. The complete biological entity should be considered when designing a value cycle.